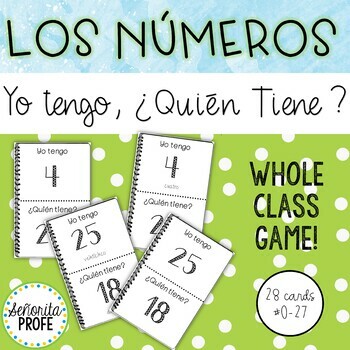 This Spanish adaptation of the popular “I have…who has…?” game is engaging and fun, allowing students to practice numbers through whole-class interaction. 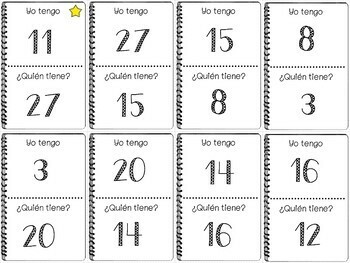 This resource includes two sets of 28 cards, numbers 0-27, with and without the Spanish vocabulary. 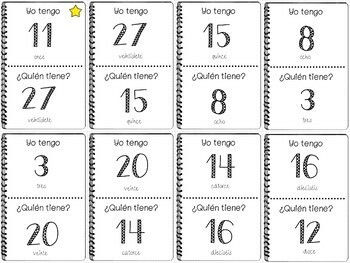 Students will practice listening to their peers and will use the numbers on their card to respond. 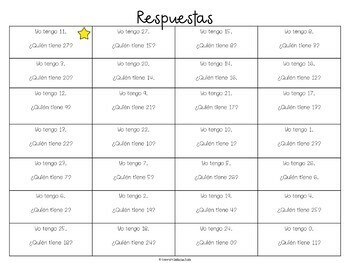 A nice opportunity to practice listening skills and Spanish alphabet letter sounds. Works well at any point during the lesson! Free numbers game available HERE. I truly appreciate costumer reviews and followers! Please take a moment to leave a review letting me and other users know how this resource worked for you! Click HERE to leave a review and learn how you can get credit points towards your next TpT purchase! Click HERE to follow me and receive product updates and freebies! Once you become a follower, you will receive updates about new resources, free giveaways and sales! 50% off new products for the first 48 hours!